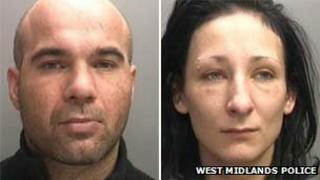 The mother of Daniel Pelka and her partner have been jailed for life for the four-year-old's murder. Magdelena Luczak, 27, and Mariusz Krezolek, 34, must serve a minimum of 30 years each for what the judge called their "incomprehensible brutality". Luczak and Krezolek blamed each other for killing Daniel who died from a head injury in March 2012. Daniel, who had also been starved by the pair, weighed just over a stone and a half when he died. At Birmingham Crown Court, Judge Mrs Justice Cox told Luczak and Krezolek, who lived in Coventry, they had "caused [Daniel] severe physical and mental suffering". She said Daniel's punishments were "designed to humiliate" and that he was "a victim of chronic and systematic starvation" in a "campaign of cruelty". Mrs Justice Cox said: "Complicity in ill treatment started with a broken arm when he was just three and a half. Image caption Sentencing the pair Mrs Justice Cox said Daniel "must have been absolutely terrified"
He was also subjected to cold water punishment. "We will never know exactly what form it took because you have not explained it - he must have been absolutely terrified," Mrs Justice Cox said. The pair "constructed a careful and wholly untruthful account" that Daniel had a serious eating disorder and learning difficulties, for which he was receiving medical treatment. "This account was deliberately designed to prevent interference by school, medical and welfare personnel, and to perpetuate the brutality being meted out to him." The judge said Luczak and Krezolek "instructed and encouraged" Daniel's sibling to tell lies to the authorities if they "were asked any questions about what was happening at home". Media captionAmy Weir: "The focus on this particular child got lost"
The judge said the level of culpability of Luczak and Krezolek was "extremely high" and that there was "minimal mitigation in this case". Stephen Linnehan, representing Luczak, told the court she had come to "this country in search of a better life" and "has now lost everything". Krezolek's barrister told the court he did not have the intention to kill and was "deeply ashamed" of his conduct [towards Daniel]. Speaking to BBC News in Poland after the pair were sentenced, Luczak's mother, Jolanta, said she was shocked but questioned the extent of her daughter's role in the abuse. Eleven of the jurors who convicted the two defendants on Wednesday returned to the court to hear the judge pass her sentence. These jurors had spent nine weeks listening to what Mrs Justice Cox described as the "harrowing details of the unimaginable acts of cruelty and brutality inflicted on little Daniel". Some of the evidence could not be reported - it was too distressing. The jurors had no choice - they had to listen. But they did not have to come back today. They chose to do so, and see the case through. As the judge recounted the terrible suffering of four-year-old Daniel, a few of them could not hold back the tears. One woman sat dabbing her eyes with a handkerchief. In contrast, Daniel's mother, Magdalena Luczak and her partner, Mariusz Krezolek, remained utterly impassive in the dock. There was no hint of emotion as the words of the judge were relayed to them through interpreters. Not even when they were told they were equally culpable and would each serve a minimum of 30 years of a life sentence before they could be considered for parole. The judge said she had observed "not a single sign of genuine remorse" at any stage during the trial from either of the defendants. There was no sign of it, either, as they were taken down to the cells. She said: "I don't know how guilty she is. She was under his [Krezolek's] influence but also England - the British state - are responsible. "How could they have not seen what was going on, I don't understand it. "The sentence should include them. "She was a normal girl, we were a normal family. It wouldn't have happened in Poland." She added her husband died of a heart attack last year - caused by the tragedy. "I lost my grandson, then I lost my husband and now my daughter," she said. "Will I see [my daughter] before I die?" The review will look at what was done by police and social services after staff at Daniel's school - Coventry Little Heath Primary School - noticed bruising on his neck and what appeared to be two black eyes. Speaking to BBC News, Amy Weir, the independent chair of the board said: "Clearly there were failings in Daniel's case and the serious case review is looking at why systems that are in place were not used." Geoffrey Robinson, the MP for Coventry North West, has called for children's services director Colin Green to resign now, rather than in September as planned. Media captionDaniel's grandmother: "She should protect the children...she was the mother"
He added Daniel was "badly let down" not just by "an evil stepfather and an indifferent and selfish mother" but also by his school, health professionals and social services. "Those who failed Daniel must examine their own consciences, and conclude whether it is appropriate for them to remain in their posts." Nushra Mansuri, from the British Association of Social Workers said it was "absolutely right" that they got the minimum term of 30 years. "There are very few words we can use to describe his [Daniel's] experience. "The next stage will be the case review, when we may get details on what was missed by agencies and this will be critical. "I wish that we could have a completely infallible system but that is not possible. "We can look at cases like Daniel's, but we cannot give a cast-iron guarantee that mistakes will never be made. "I agree it is difficult to see how he could slip through the system and that is why we need to examine the decision taken." Senior crown prosecutor, Lisa Windridge, said: "We hope that the sentence today brings closure to this case to the family of Daniel both in this country and in Poland. "This has been a very difficult case for all of those involved with it and we are pleased that justice has finally been achieved for Daniel Pelka."